Bioprinting, a type of 3D printing, uses cells and other biological materials as “inks” to fabricate 3D biological structures. Bioprinted materials have the potential to repair damaged organs, cells, and tissues in the human body. In the future, bioprinting may be used to build entire organs from scratch, a possibility that could transform the field of bioprinting. Researchers have studied the bioprinting of many different cell types, including stem cells, muscle cells, and endothelial cells. Several factors determine whether or not a material can be bioprinted. First, the biological materials must be biocompatible with the materials in the ink and the printer itself. In addition, the mechanical properties of the printed structure, as well as the time it takes for the organ or tissue to mature, also affect the process. Water-based gels, or hydrogels, act as 3D structures in which cells can thrive. Hydrogels containing cells are printed into defined shapes, and the polymers in the hydrogels are joined together or “crosslinked” so that the printed gel becomes stronger. These polymers can be naturally derived or synthetic, but should be compatible with the cells. Aggregates of cells that spontaneously fuse together into tissues after printing. 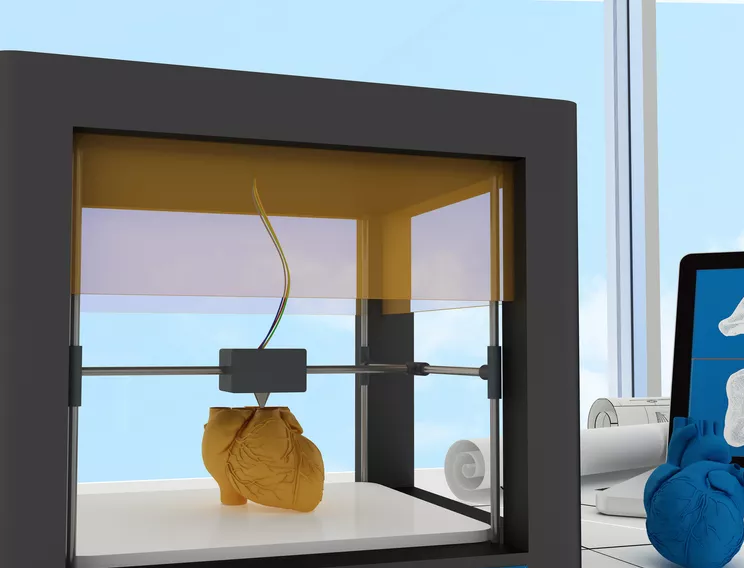 The bioprinting process has many similarities with the 3D printing process. Preprocessing: A 3D model based on a digital reconstruction of the organ or tissue to be bioprinted is prepared. This reconstruction can be created based on images captured non-invasively (e.g. with an MRI) or through a more invasive process, such as a series of two-dimensional slices imaged with X-rays. Processing: The tissue or organ based on the 3D model in the preprocessing stage is printed. Like in other types of 3D printing, layers of material are successively added together in order to print the material. Postprocessing: Necessary procedures are performed to transform the print into a functional organ or tissue. These procedures may include placing the print in a special chamber that helps cells to mature properly and more quickly.